Rome,Rome, Sorrento, and Capri—three of Italy’s most popular cities are waiting for you on this grand Italy vacation. 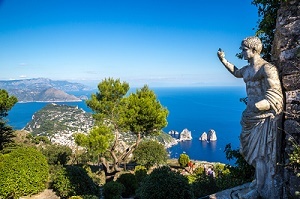 Spend four nights in Rome and two nights each in Capri and on the Neapolitan Riviera on this affordable Italy tour at a leisurely pace, featuring ancient historic sites, spectacular scenery, and authentic Mediterranean charm. Discover Sicily, a legendary island of breathtaking beauty, rich in history and culture. History buffs will love the views of Rome’s Colosseum where gladiators fought to the death during the Roman Empire. You’ll also see the Roman Forum, dating back to the 7th century. Enjoy a guided tour of Pompeii, which was completely buried during the eruption of Mount Vesuvius in 79 AD. This preserved town gives you an amazingly detailed look into ordinary life 2,000 years ago at the peak of the Roman Empire. In Sicily, visit the Valley of the Temples to see remains from ancient Greek civilization, as well as the famous mosaic depicting the “bikini girls” in the Roman villa at Piazza Armerina. There is no shortage of spectacular scenery throughout your affordable tour of Italy. Enjoy views of the valley from Montecassino Abbey, and visit the heights of Mount Etna – Europe’s most active live volcano. You’ll witness breathtakingly beautiful views on your excursion to the Amalfitan Coast. The majestic St. Peter’s square in Rome, the sapphire-blue waters of the strait of Messina, the lush orange groves on the flanks of Mount Etna, and the friendly smiles of the local people will create lasting, fond memories. You’ll cherish this unique Italy vacation designed for the value-minded traveler. 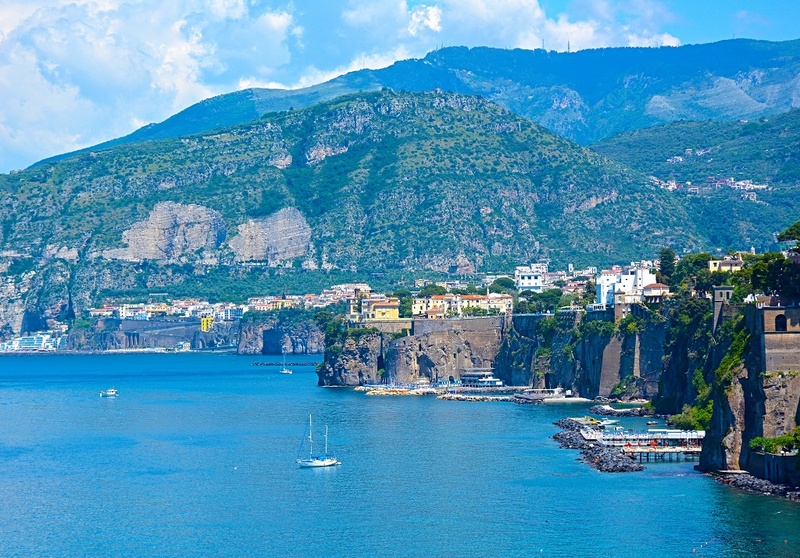 Visits to Sorrento, Capri, Amalfi. Two days to get well acquainted with Rome. Included sightseeing with a Local Guide starts with St. Peter’s Square and Basilica. Other highlights are the iconic Colosseum, the largest amphitheater ever built; the Roman Forum; Piazza Venezia, and Campidoglio. An optional visit is available to the Vatican Museums and Sistine Chapel, world famous for Michelangelo’s impressive fresco of The Last Judgment. Visit the impressive Benedictine Abbey in Montecassino and the WWII battlefields and memorial nearby. Then, to POMPEII, where time stopped in 79 AD when the Vesuvius eruption totally buried the city. On the included guided visit, see the remains of luxurious villas, temples, theater, and forum. Embark on the FERRY to Capri to spend two nights on this charming island. Today, by way of the autostrada, travel through the wild and mountainous scenery of Italy’s most southern regions before boarding the FERRY for the 45-minute crossing to Sicily. Only a few more miles to the Taormina area, where you stay for two nights. Magnificently situated on a 700-foot plateau overlooking the Ionian Sea, the heart of Taormina is Piazza Nove Aprile, a paved square with unrivaled views of the sea and Mount Etna. Enjoy a visit to the heights of MOUNT ETNA and the option of a jeep or cable-car ride for a better view of Europe’s largest active volcano. Today, drive westwards to Piazza Armerina, a maze of steep streets positively overflowing with the colorful atmosphere of Sicilian life. At nearby Casale, visit the ROMAN VILLA, a UNESCO World Heritage Site and famous for its mosaics including the whimsical “Bikini Girls.” Next on the agenda is Agrigento’s Valley of the Temples, one of Italy’s archaeological jewels. Visit the DORIC TEMPLE OF CONCORD, one of the finest examples of Greek civilization existing today, and the hilltop TEMPLE OF JUNO LACINIA. Spend the night in Agrigento. Leave for Selinunte, one of the most striking and interesting sites in Sicily. At the apex of its power before 409 BC, the city exceeded 30,000 people, excluding slaves. Here, you will see the remains of the ACROPOLIS with its temples and fortifications. On the western coast of Sicily, stop in Marsala, known for its celebrated Marsala wine. Here, you will visit a local SALT MILL and learn how this local product is extracted and refined. Then, head to Palermo, capital of Sicily. Two Sicilian treats are on the agenda today. First, visit enchanting Trapani with a Local Guide, set on a harbor that was once at the heart of a powerful trading network stretching from Carthage to Venice. The city center stretches along the port and was built in primarily baroque style. Next is the medieval hilltop town of Erice, reached by cable car. Situated about 2,500 feet above sea level, it immediately impresses with its defensive walls and castle affording breathtaking views over the Trapani Gulf and Egadi Island and on clear days, all the way to the African coast. Return to Palermo. A full day to enjoy this busy and colorful city full of interesting squares and marketplaces, churches, and palazzos in every style—from Moorish to baroque. On the included guided tour, learn more about this city, and visit the magnificent CAPPELLA PALATINA. Evening embarkation for the overnight ferry from Palermo to Naples. As a full-service travel provider, we can help you in finding your perfect tour at the best price available, today. We've been representing the GLOBUS Family of Brands for over 35 years as a Premier Agency Partner - a designation only awarded to the top tier agencies that are authorized to represent the full Globus Family of Brands. We can take you all the way from your own hometown to some of the most beautiful touring experiences in Europe and then back again - all with the expertise of a seasoned COSMOS professional representative. When it is important to get it right, you can trust the services of our own professional COSMOS Certified travel specialists. Thank you for your interest in this quality Cosmos Tour by The GLOBUS Family of Brands! 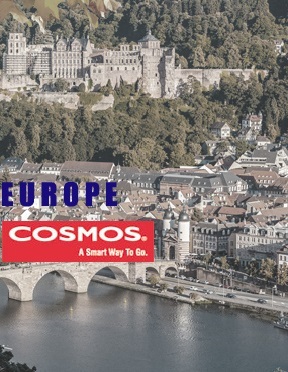 More than three decades ago Cosmos pioneered the idea of quality value travel to Europe. Since then we've developed and refined the concept of vacation packages. Over a million people have come back to us for a second or third vacation...or more! Our clients' repeat business is the best testimony to the incredible value and experience we offer. If you've never taken a package vacation, consider this: Traveling with Cosmos is less expensive, more comfortable, and far easier than going it alone. Our volume contracting for hotels and services provides you with travel at wholesale prices. A Cosmos package is carefully planned to make the best possible use of your time. Our team of experts has refined our itineraries to combine the must-see sights with significant time on your own, offering more choice and flexibility. You can travel relaxed and hassle-free, knowing that we've taken care of all the details. Once you've discovered the special advantages of traveling with Cosmos, you'll never want to travel any other way again. Cosmos is "A Smart Way To Go." Where you stay makes all the difference. After a day's traveling you want to relax at a comfortable, clean, and attractive hotel. We have chosen hotels with the best rooms, service, and food for the money. Of course, they vary as different countries have different standards. However, we ensure that everywhere you get the best available in cleanliness and comfort. Cosmos hotels are always located in good neighborhoods, some more centrally and others in residential areas. Especially in large cities we sometimes prefer good hotels in residential areas on the outskirts to less desirable or overpriced downtown hotels. Rooms at all our hotels include private facilities: private bath or shower and a toilet. Triple rooms are usually no larger than twin rooms and the third bed is often a roll-away bed put into a twin-bedded room just for the night. Our hotels are mainly superior tourist-class (ST) and tourist-class (T) establishments, but we also feature some first-class (F) hotels. Cosmos hotel ratings follow standards set by the independent Official Hotel Guide (OHG) or by national tourist boards. The specific rating for each contract hotel is determined by our quality controllers. We reserve the right to substitute hotels listed on the tour pages with hotels of equivalent standard. With your Cosmos travel documents you'll receive a list of hotel addresses, telephone numbers, and fax numbers for your tour. Value-packed vacations at bargain prices. With Cosmos, a company that specializes in package travel arrangements, you'll visit the world without spending a fortune. Because all our buying power is devoted to package travel, our clout with suppliers is powerfully concentrated -- and we pass the savings on to you with affordable vacation packages for every budget. More than one-third of all people traveling with Cosmos are traveling independently. We therefore accept reservations on a "guaranteed share" basis. We charge singles the basic price and match up singles of the same gender in twin-bedded rooms. For mutual comfort we adopt a no-smoking rule in shared rooms. "Guaranteed shares" are not available for extra nights before or after your tour, on tours with overnight trains, or on train or cruise extensions. If we cannot find a roommate for a traveler who has booked on a "guaranteed share" basis, we'll absorb the single room supplement, and that traveler will be accommodated in a single room at no extra charge. Of course we do offer single rooms when available to those who prefer to travel solo and pay the single supplement. Cosmos grants a reduction to three people who travel together and share the same accommodation. Triple room reductions, when available, are listed in the Dates and Prices box on the tour page. A word of caution: Triple rooms usually are no larger than twin rooms, and the third bed, if there is one, is often a rollaway bed put in a twin-bedded room for the night. Cosmos grants a 10 percent discount on the land tour price to travelers who are under 18 years old on the tour departure date, provided they are accompanied by an adult. We do not accept children under eight on our tours because we have found that they are too young to enjoy these vacations. Many Cosmos land arrangements start and end in London. If you have already spent time in the British capital, you may want to skip one or more of the included London nights or even join at the first overnight hotel on the Continent. 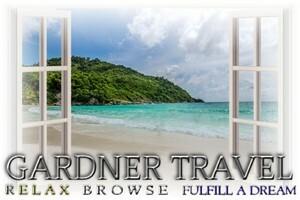 Call your Travel Agent for any reductions that apply to your vacation for joining late or leaving early. Vacations with these reductions are sold on a land-only basis. For any help or information you might require during your London stay, please contact the Cosmos hospitality desk at your hotel. Our knowledgeable staff will serve you with a smile; give you guidance on what to do and where to go; and arrange excursions, evening entertainment, and theater outings for you. If you'd like more hotel nights than we've provided at the start or end of your tour, we can make reservations for you at the rates quoted below, provided you request them at the time you book your vacation. Rates are per person, per night, and include room with private bath, breakfast, service charges, and taxes. Extra nights are only available immediately prior to or after your tour. Extra pre-tour nights in London are not available if you join your tour later than Day 2. Every effort is made to reserve extra nights at the hotel where your tour stays. If space at the tour hotel is not available, alternative accommodation will be reserved at a hotel of equivalent standard. When this is the case, the transfer to and from the tour hotel is at our expense. As hotel space is limited, we cannot reserve more than two extra nights before and/or after a tour, unless they are needed to bridge the gap between two Cosmos vacations. During particularly busy periods, hotel space in certain cities can become so tight that we may be unable to sell extra nights. Check out our SOUTHERN BREEZE GOLF TOURS! Golf packages for select destinations and clubs throughout the Southern U.S!